I am looking into the life and art of May Stevens, an American working class artist, feminist and committed political activist. Stevens was born in Dorchester MA in 1924 and grew up in Quincy. She studied art at the Massachusetts Art School in Boston and later on in the Académie Julian in Paris, where she lived for 3 years (1948-1951) with her husband just after the second World War. On returning to New York, she became actively involved in the social movements of the turbulent 60s, fighting against racism, imperialism, war and sexism. It was through these movements that she came of age as an artist. Her art and politics have been inextricably interwoven. Her work actually creates a kind of möbius strip with her politics, you are never sure which is the inside or outside. However if we were to create a chronology of what I will call Steven’s artpolitics, her early ‘Big Daddy Series’ expressed her involvement in the civil rights movement and the anti-Vietnam war protests. The dominant figure of this series is her patriotic working class father, depicted as both powerful—draped in the American flag, or impersonated as Holly Trinidad—and impotent—he is after all, a paper doll. We have in this early work the emergence of a motif of couplets, dualisms and antitheses that will recur in her work, particularly with the Ordinary/Extraordinary series. There are two other themes in her ‘Big Daddy Series’ work to note: first, the mingling of the personal and the political; it is her daddy after all, whose caricature she draws, as a patriarchal symbol of nationalism, religiosity, patriotism, oppression and violence, and second an early intersectional approach to gender issues that went through her artwork and politics like a red thread. Stevens, by contrast, would highlight the fact that social class and race were part and parcel of women’s oppression in ways that were often subtle and barely discernible. In this light, in 1982 she invited the black artist Vivian Browne to join Heresies and together they edited a special issue on race, called Racism is the Issue. Stevens’ feminist politics are most starkly expressed in her series of [counter] historical paintings, as her famous Soho Women Artists (1978), Mystery and Politics (1978) and Artemisia (1979). This was a project of re-imagining women as historical subjects through an intervention in the high genre of historical paintings, which was initiated by The Artist’s studio, after Courbet (1974). “Ordinary. Extraordinary. A collage of words and images of Rosa Luxemburg, Polish/German revolutionary leader and theoretician, murder victim (1871-1919), juxtaposed with images and words of Alice Stevens (born 1895) housewife, mother, washer and ironer, inmate of hospitals and nursing homes. A filmic sequence of darks and lights moving through close-up to long-view and back. Oblique. Direct. Fragments of Rosa’s thought from intimate notes sent from prison to her comrade and lover, Leo Jogiches, and to her friends; from agit-prop published in Die Rote Fächne; and from her serious scientific writings. Images from her girlhood, her middle life, and the final photograph of her murdered head. Alice’s words from the memory of and letters to her daughter. An artist’s book examining and documenting the mark of a political woman whose life would otherwise be unmarked. Ordinary. Extraordinary." Epistolary narratives and the force of human communication through writing thus become important compositional elements of the Ordinary/Extraordinary series. Having read many articles from exhibition catalogues of the Ordinary/Extraordinary series I was intrigued by the way the use of letters in the texts of the collages and the artist’s book was of course mentioned, but never really commented, analysed or discussed. Although art critics have not analysed the use of letters in the Ordinary/Extraordinary series, in her recorded conversations with Patricia Hills, Stevens has referred extensively to how she was drawn to Rosa Luxemburg by reading her correspondence to her lover Leo Jogiches. Luxemburg’s letters seem to have triggered the very ambiguity of the Ordinary/Extraordinary distinction that Stevens was playing with in the artist’s book and the subsequent art series: Rosa Luxemburg and Alice Stevens as both ordinary and extraordinary women, exposing themselves through their epistolary fragments as unique and unrepeatable, but also vulnerable, relational and dependent on significant others. Although written ‘to the moment’, as all letters are, in crystallising the moment and spirit of its creation, the letter intervenes in our perception of linear time and finite life and shows that the force of human life, if rendered into a story, transcends the limitations of the life-span and enters the discourse of history, which ‘ultimately becomes ‘the storybook of mankind with many actors and speakers and yet without any tangible author’ (Arendt, 1998, 184). Not only do individual human lives enter the discourse of history, Arendt argues, but actually their life stories are creating conditions of possibility for history itself: ‘That every individual life between birth and death can eventually be told as a story with beginning and end is the prepolitical and prehistorical condition of history, the great story without beginning and end. Stevens was particularly preoccupied with this idea of the unfinished story, forcefully and dramatically encapsulated in the famous ending line from Luxemburg’s last known piece of writing, Order Prevails in Berlin, “I was, I am, I shall be!” has become for Stevens the phrase that dominates Voices—her painting of Luxemburg’s funeral—thus transforming her death from an end to an event creating possibilities for new beginnings. Stevens’ artistic practices work as what I want to call, anti-rhythms in the distribution of the sensible. I draw here of course on Jacques Rancière’s notion: ‘I call the distribution of the sensible the system of self-evident facts of sense perception that simultaneously discloses the existence of something in common and the delimitations that define the respective parts and positions within it.’ The ‘distribution of the sensible’ is therefore a system where inclusion and exclusion work hand in hand - defining the grounds, subjects and implicit laws of certain communities of practice and thought. It has to be noted here that the ‘sensible’ should not be understood as something that makes sense, but as something that can be perceived by the senses, ‘what is visible and audible as well as what can be said, thought, made or done’. As Rancière suggests, ‘the distribution of the sensible reveals who can have a share in what is common to the community based on what they do and on the time and space in which this activity is performed.’ This is the point where he rigorously argues that ‘there is “an aesthetics” at the core of politics’. Having intervened in the aesthetics of the distribution of the sensible, Stevens’ practices have sided with what Rancière has identified as the crucial link between ‘the “aesthetic” avant-garde and the “political” avant-garde: ‘the invention of sensible forms and material structures for a life to come’, a kind of ‘aesthetic anticipation of the future’. Art as critique is therefore extended to politics, art and politics becoming constitutive of each other, artpolitics as I have argued. Arendt, H. 1985. The Origins of Totalitarianism.New York: A Harvest Book. Arendt, H. 1998. The Human Condition. Chicago: University of Chicago Press. Barthes, R. 2000  Camera Lucida. Trans. R. Howard. London: Vintage. Rancière, J. 2009. 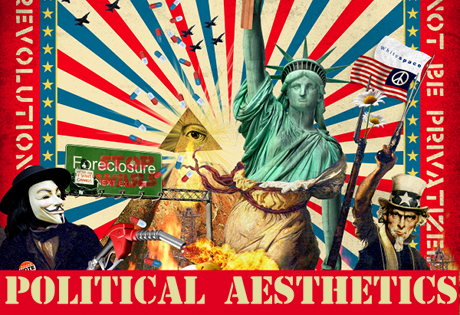 The Politics of Aesthetics.Trans. G. Rochill. London: Continuum. Tickner, L. 1984. ‘May Stevens’ in Ordinary/Extraordinary, A Summation 1977-1984. Witzling, M. R. 1994. Ed. Voicing Today’s Visions: writings by contemporary women artists. New York: Universe Publishing.